Welcome to PA Hypno Center on Weebly, music resource, authority, and occasional record label. We are your resource for all your audio and music interests. We share interesting posts, links and even the odd review. Want to connect with us? Hit us up at the contact page. Finding headphones can be easy. Finding comfortable headphones? A little bit more difficult. Finding comfortable headphones for big ears? Well this can sometimes be a challenge. Sometimes it's the thickness or material of the ear pad. Perhaps it's the headband size? More often than not it can often be an issue with the ear pad size. Here we will take a look at three options for such a headset. We have picked three headsets which offer comfort, ample ear pad size, great sound quality, and also value for money. In no particular order, lets take a look at our top three picks! 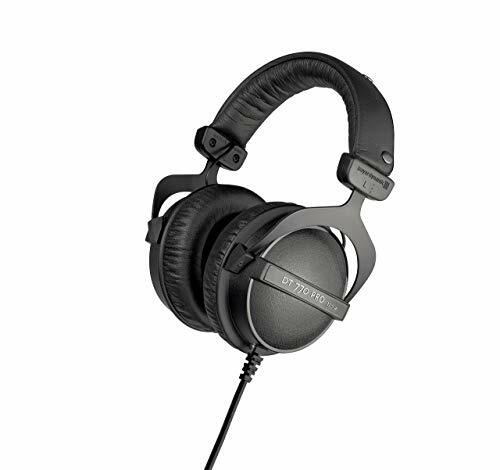 The DT 770 PRO from Beyerdynamic is ideal for the person with larger ears but is looking for comfort. Audiophile sound grade, durability, a great price point, and overall superb execution. However take the following into consideration to decide if it will meet your requirements. You will find the perfect combination of practicality and stability in these lightweight but durable headphones. These headphones are so comfortable that you will be able to wear them daily, and for long periods. Ideal for both enthusiasts and professionals alike. Large ear cups for big ears, and the headband is also comfortable thanks to the soft padding. It's not just about the comfort however with the DT 770. The execution of the audio quality is also outstanding. The frequency range lies at 5 – 35.000 Hz giving it a crisp sound. Also the 770's deliver punchy bass. There are also variations which offer a different ohm range depending on where you want to use these (80 for general use, 250 for studio). In terms of the colors they are available in in black or grey and feature lovely plush ear pads. A generous 3 meter cable is also included. In terms of the disadvantages, these aren't really suitable as headphones on the go due to their size, lack of portability, and also cable length. Also you may find yourself wanting more give/flexibility in the headband. A great pair of budget studio headphones which are comfy, look great and offer you options in terms of their performance depending on how you wish to use them. Looking for a comfy headset from a highly respected headphone brand which offers a great design, wide frequency range, large drivers and strong bass? Then look no further than the Audio-Technica ATH-WS1100iS. The dual layer ear pads offer comfort for extending periods due to a firm internal layer placed over a soft outer layer. Aside from comfort you will also experience improved sound isolation in noisy environments. If you have big ears then these headphones offer a generous and above average ear cup size. A frequency range of 5 – 40,000 Hz is achieved by the 53mm drivers which have powerful magnetic circuits that deliver highly accurate audio output across the wide frequency range here. The ATH-WS1100iS features a nice textured and rich bass, which sounds great across a range of genres. The bass venting system promotes air movement around the drivers to enhance the bass further. The cable length on the headphones is a 1.2m detachable cable. Also a nice addition is a pouch the enable the headphones to be transported whilst reducing the risk of damage. In terms of the disadvantages of these headphones, they are thankfully few and far between. I would say that despite the carry pouch these aren't the most portable headphones as they do not collapse. Also the mid-range in the sound could be improved slightly. In summary, the Audio-Technica ATH-WS1100iS offer a great balance when it comes to sound quality, bass, and comfort. They also come at a nice price too. AKG are know for producing only premium quality headphones. And with the K702 you have the comfiest headphones for big ears from this company. No expense is spared in terms of look and comfort with this product. AKG have strived to improve the comfort of the K702 over the years. The headband has little padding to speak of as such. But AKG more than make up for this with the padding for the ears pads. This padding is also breathable, allowing heat and moisture to ventilate. Size wise, these are certainly one of the larger ears pads on the market. AKG acoustics are renowned as being among some of the best in the industry. Since 1947 the company has been awarded over 1,500 patents. How's that for innovation! Crisp notes can be enjoyed across the 10-39,800 Hz frequency range. These headphones employ an open back design that drastically increases the size of the sound stage. Looking for that audio experience where you feel the artist is in the room with you? Then the K702's are for you. So what are the downsides to such a headset? Some may find that the k702 is lacking noise isolation. This isn't particularly a disadvantage unless you are using them in a quiet location around others, such as a workplace. Also the 3 meter long cable may be somewhat impractical for use anywhere other than in a studio or at home. The AKG K702 is a premium headphone choice in the big ears category, but they are great value and offer a lot for the price. The combination of comfort, wide frequency range, and outstanding clarity make these headphones easy to fall for. Well there we have it with our round up of comfortable headphones for big ears. These three headset heavyweights all offer a great solution for a headset for those with large ears. Looking for a great pair for use at home or in the studio? Try the Beyerdynamic DT 770 PRO. Need a great pair of general use headphones which are at home playing any music genre? Try the Audio-Technica ATH-WS1100iS. If you have a little more to spend then go with the AKG K702. You will be rewarded with some of the best acoustics in the business, and they also have that wow factor in terms of looks. I hope you found this article helpful. Please keep checking our blog for more reviews like this. For more information on headphones like this, check this article which covers more headphones for big ears. Sphero, who you will normally find making robots and such, are bringing something a little musical, and a little different this year. The Sphero Specdrums let you create music by tapping anything around you, with each colour forming a different note. Mount the sensors on each finger facing towards a surface then tap away to your hearts content. New Korg Product For 2019? Korg has took to twitter recently to tease a new product. What is it? Who knows! Judging by the photo it's too big to be a full sized synth. Could it be some kind of Minilogue or Odyssey-sized synth however? Only time will tell. Either way I'm sure Korg won't disapoint. So after the drama with our last blog we decided to start over. So here is our fresh new blog where we will splurge on all our audio and music loves. We will try and keep updated as often as possible with the latest news, reviews and articles. We'd love to hear from you if you have anything to contribute to our blog so please get in touch via the contact page.